Currently I'm living in Freidorf, Germany where I am a Writer in Residence at the Beaumont Farm. 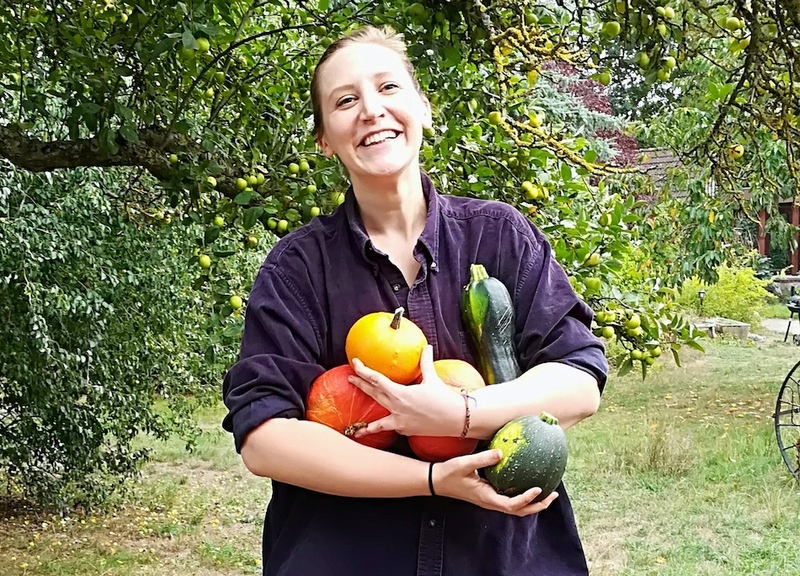 Apart from harvesting hoards of squash (see attached photo), I work with various farm animals, assist in the English Language Learning camps that are held in the summer months, help guide the writing retreats that are held through out the rest of the year, and, of course, write. I have a few different writing projects in development, though my time is mostly divided between grad school applications (sigh) and a collection of creative nonfiction essays. My work in the Writing Center truly has shaped my professional life! After graduating, I took a fellowship position at NYU's campus in Abu Dhabi where I worked in their writing center and helped support first-year writing seminars. The following year I was hired on as a Writing Instructor and actually spear-headed the development of a peer tutoring program. I was able to use my experience as a peer tutor in the Haverford Writing Center as a model for this new program. Following my time in Abu Dhabi, I relocated to New York where I worked as an Editorial Assistant at a literary agency, a position which required fine attention to detail and a solid grasp on writing practice and pedagogy. Tutoring writing during college certainly helped me build the skills necessary for all of these positions! After my time in New York, I was ready to be immersed in nature and spend a good chunk of time focusing on my own writing. I was fortunate in that I happened to know a couple of former colleagues who were starting up a new writing residency so I jumped at the opportunity! I'm very grateful to have this time to develop my own writing practice and employ many of the skills that I've worked on developing in other writers for the past few years. See above for the other positions I've held since graduating. Since I'm currently at a full-time writing residency, writing is truly the bread and butter of my work. Even though there are many tasks involved in keeping the farm running, I make sure to carve out a chunk of time everyday to write, journal, or read (reading is an important part of the writing process!). In addition to my writing, I've also recently created a literary magazine, Headway, which aims to demystify the writing process by placing product and process side by side. In allowing the process to become a part of the interpretation of the "final" piece of writing, we hope to call into question the idea of finality and completion that publications presuppose, and call attention to the importance of revision and process. It has been very rewarding to be both producing writing and curating the writing of others, as the two pursuits inform one another and in many ways have a symbiotic relationship. In my own practice, the most important thing that I've learned about writing is that writing doesn't have to be, shouldn't be, and really never is perfect. It's easy to forget that even your favorite novelists feel writer's block and create sentences that they aren't necessarily proud of. It's all a part of the process and it's freeing to allow yourself to not get bogged down by the minutia. And don't be afraid to call yourself a writer! You don't have to be a published author to be a writer and sometimes just saying it makes the writing come more easily.